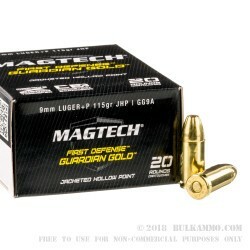 The MagTech First Defense Guardian Gold in 9mm Luger in 115 grain JHP is an exceptionally accurate and very good penetrating round that offers great performance for the weight class and caliber for a self-defense ammunition. The reliability and consistency of the MagTech First Defense Guardian Gold ammo line is very high, and that’s the most important variable in the personal defense equation. You need to know that your ammunition will fire, function your firearm and land where you want it to land when you need it. Not only that, but you need it to happen the first time without exceptions. MagTech’s premium lines have always been pretty solid on reliability and production consistency. Certainly that doesn’t equate to good expansion and penetration necessarily, but in the case of this ammunition, there is exceptional penetration thanks mostly to the grain weight and velocity but also the diameter expansion is pretty good too. The reliable deformation and mushrooming of the projectile is substantial for the 115 grain weight. 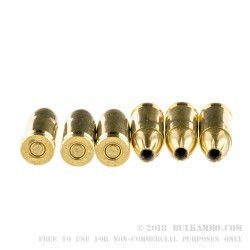 The reliability in general, of the bullet performance is top notch for this projectile. 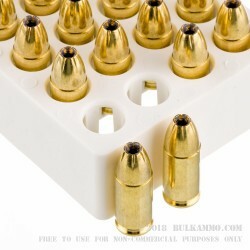 Suitable for use in any 9mm firearm and packaged in 1 box of 20 rounds. My first 2 shots the spent casing would not eject and the one below it would not load correctly. It kept repeating the through the whole magazine.